This image is less a caricature and more a portrait, and it accompanied a lengthy biographical article about Arnold in The Illustrated Review Volume III Number 32. The article’s author is not provided, but Arnold, in a letter to his mother of 4 February 1872, writes that he believes it is by Charles Kent, a friend of Charles Dickens. What makes this portrait worthy of consideration in a series that is otherwise devoted to caricatures is that it gave Arnold himself pause to reflect on his appearance. Arnold writes to his mother of the portrait, “the picture is not offensive but rather like an old sheep.” The simile Arnold uses suggests an awareness that he is perhaps overly benign and/or unaggressive. The use of “old” is telling, for, as several Arnold biographers have noted, Arnold was well aware that he was living on borrowed time, and sometimes, at the end of the year, he noted how many years older than his father he was when the elder Arnold died. Arnold would have turned 49 in December of the preceding year. 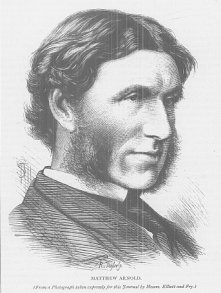 His father, Dr. Thomas Arnold, died of a massive congenital heart defect (which Matthew Arnold inherited) when he was only 46 years old. This image was accessed via ProQuest’s British Periodicals database, and is copyright 2006 by ProQuest Information and Learning Company.